Looking for value for money? Then you can’t go wrong with Double Decker’s brand new Hop On Brunch. With house beverages and a generous buffet on offer for just Dh200, you and your crew can party hard for a whopping four hours. For grub, expect classic pub fare like bangers and mash, Shepherd’s Pie and garden burgers, as well as an outdoor BBQ station. To add to the fun, there’s also plenty of organised games, from giant Jenga to spin-the-wheel; not to mention the live band and the DJ to keep you on your feet through the brunch. Where: Double Decker, Roda Al Murooj Hotel, Dubai. When: Every Friday, 12pm to 4pm. Price: Dh220 for ladies with house beverages, Dh250 for men with house beverages, and Dh22 for premium beverages. Understated and chic as the name of the brunch says, the Saturday brunch at The Restaurant at Address Boulevard is perfect for a laid back afternoon of great food in a luxurious setting. The sophisticated brunch offers up a melange of Mediterranean, Asian and Middle Eastern flavours. Featuring live cooking stations, some of the standout dishes at the brunch include Hamachi nigiri with sturia caviar, fresh oysters, Asian-style beef tartare, risotto with seasonal mushrooms and truffled vichyssoise. Folks with a sweet tooth cannot miss the stunning dessert table — the handcrafted creations are a treat for the eyes and the tastebuds. Opt to sit out in the terrace (featuring a great view of the Burj Khalifa), and enjoy some gentle house music from the resident DJ. Where: The Restaurant, Address Boulevard, Downtown Dubai. When: Every Saturday, 1pm to 4pm. Price: Dh345 with soft beverages, Dh445 with select house beverages and DH545 with premium beverages. For those of you who prefer to go big or go home, a mega brunch is coming your way next week. 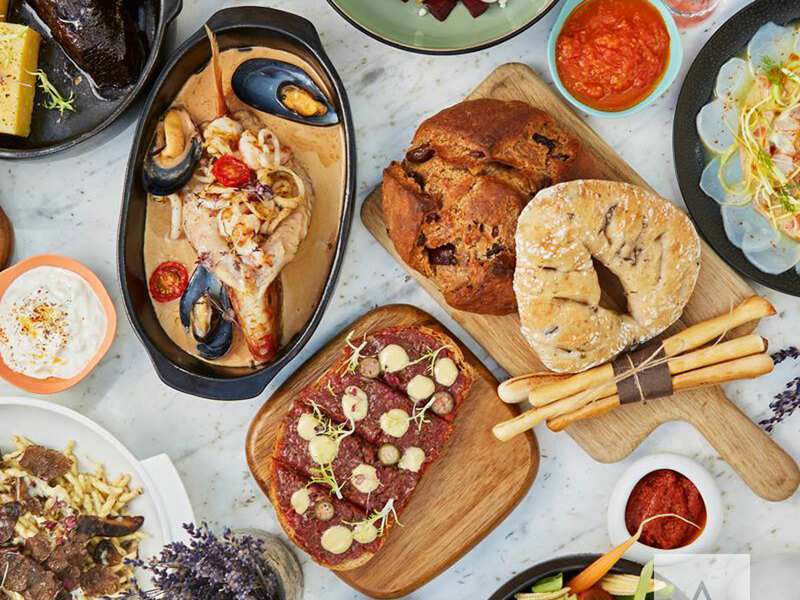 Taking place at Dubai’s Century Village, the Garhoud mainstay is collaborating with its neighbours Jumeirah Creekside Hotel and The Irish Village to bring you one of the biggest brunches the city has seen. With more than 25 cuisines on offer from across 10 restaurants, even the pickiest of eaters won’t be left wanting. Participating restaurants include SoHo Bar and Grill (steakhouse), Sushi Sushi (Japanese), Nomad (fusion cuisine), Zorba (Greek), da gama (Portuguese), 360 Cafe & Bistro (Italian), Baranda Restaurant (Lebanese), La Vigna (Italian) Masala Craft (Indian), and of course The Irish Village. The brunch promises loads of fun for the family as well, featuring three separate kids areas, live music, a children’s cinema and street artists and performances. Where: Customers can book a table at any of the participating restaurants mentioned above at Century Village, the Irish Village or the Jumeirah Creekside Hotel, but can sample food from any of the restaurants. When: January 25, 1pm to 4.30pm. Price: Dh225 (soft beverages and food), Dh375 (food and house beverages), Dh105 (children 4-11 years) and children under four years of age go free. Replacing their successful Secret Garden Brunch, the Palm-based resort recently introduced the Great Waldorf Astoria Brunch, that’s supposed to be (very) loosely based on the Hollywood film ‘The Greatest Showman’. Taking place in the hotel’s main dining spot, the Mezzerie, the spread at this brunch offers both quality and quantity. While we were drawn to the seafood station more than once, featuring fresh oysters, prawns and lobster, as well as the excellent sushi station, another highlight was the whole lamb spit roast set up on the terrace. The chef repeatedly would wheel out speciality stations, with which he’d go table to table, making unique creations for the guests. The charcoal cotton candy topped decadently with gold foil stood out for us. The brunch highlight was, however, a lanky magician who went table to table performing some very impressive card tricks for the guests. We spotted a couple of tables asking for an encore performance. A live saxophonist and a resident DJ complete the show. Where: The Mezzerie, Waldorf Astoria Dubai Palm Jumeirah. When: Every Friday, 1pm to 4pm. Price: Dh375 inclusive of soft drinks, Dh495 inclusive of premium and sparkling beverages, and children below six years old dine for free and children between six-12 years old dine with a 50 per cent discount. Manzil Downtown brings you the ultimate barbecue experience with their new Backyard Brunch. Every Friday, enjoy a selection of flavourful barbecue from live cooking stations and a multi-cuisine menu in a relaxing alfresco setting of The Courtyard. Indulge in traditional Levantine and Middle Eastern cuisine along with American and southern hemisphere fare in a contemporary Arabesque atmosphere. Expect kebabs, fishes, authentic koftas, chicken tikka, spit-roasted lamb along with traditional sharing platters. The southern hemisphere station will offer favourites such as chicken and beef skewers, lamb chops, chargrilled corn, toasties and potjiekos with pap and chakalaka, from Africa, Australia and New Zealand. For the adventurous, the brunch also features DYI drink stations for guests to get creative and play mixologist. Where: The Courtyard, Manzil Downtown, Dubai. Price: Dh345 including unlimited house beverages and Dh265 including unlimited soft beverages; children (6-11years) - Dh133 per child; and children up to the age of five years dine for free.